New-Tech MERV 18 HEPA filtered Down Draft Tables. 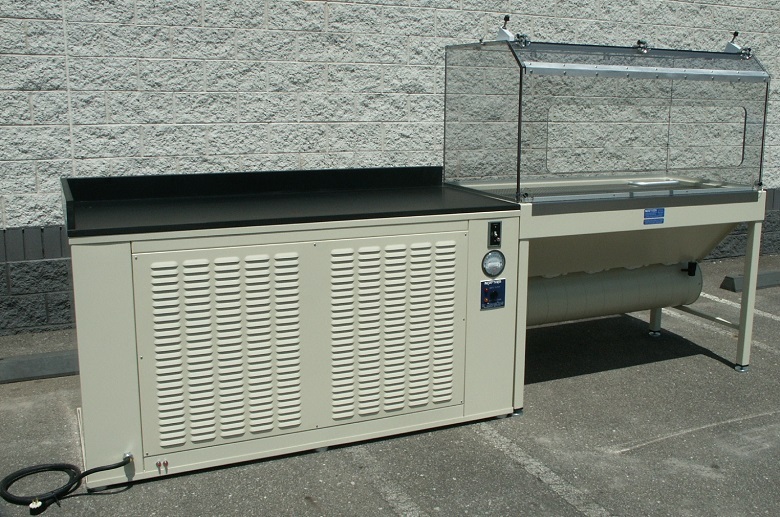 The MERV 18 HEPA Filtered Down Draft Table has been designed to work in Mail Rooms or on Remediation Projects. The MERV 18 HEPA Filtered Down Draft Table provides 99.99% efficient capture of 3 micrometer particles, (IEST-RP-CC001.3, Type C), as it draws the air down through the perforated top into the HEPA filter. The MERV 18 HEPA Filtered Down Draft Table has a filter module designed specifically for hazardous applications. The MERV 18 HEPA filter is handled as a completely contained module, and can be 100% incinerated. The MERV 18 HEPA Filtered Down Draft Table has a four or five foot containment surface with an adjoining six foot filter/fan box that has the MERV 18 HEPA filtration module and quite fan system below. The MERV 18 HEPA Filtered Down Draft Table plugs into your standard 120 volt receptacle utilizing a SO cord, the four foot containment surface unit requires only 8.6 amps and the five foot containment surface unit requires 12.0 amps. The MERV 18 HEPA Filtered Down Draft Table comes with Fan Pilot Light, Airflow Indicator and audible/visual Dirty Filter Alarm. Optional "Wing Walls" or a Polycarbonate Containment Enclosure (pictured above) are also available for enhanced containment. An optional Epoxy Top (pictured above) is also available on the top of the adjoining filter/fan box. Optional MERV 8 Pre-Filters are also available below the perforated surface to extend the life of the MERV 18 HEPA filter.